Now, Aadhaar cards will be accepted as valid travel documents for Indians, aged under 15 and over 65 years, while travelling to Nepal and Bhutan, stated a Union Home Ministry communique. However, as per a report published on Sunday by daily hunt Indians other than those mentioned in the two age groups would not be able to use Aadhaar cards for travelling in the two neighbouring countries Nepal and Bhutan, for which no visas are needed, the communique, which was issued recently, stated. It may be mentioned that Indian citizens can go to Nepal and Bhutan without visa but they require to have valid passports, photo identity cards issued by the Government of India or an election ID card issued by the Election Commission, the communique added. Earlier, to prove their identity, people over 65 and under 15 could produce their PAN card, driving licence, Central Government Health Service (CGHS) card or ration card to visit the two countries, but not the Aadhaar card. Now, the Aadhaar card has been added to the list of documents needed as a proof of identity to travel Nepal and Bhutan, the report quoted a senior Home Ministry official as saying. 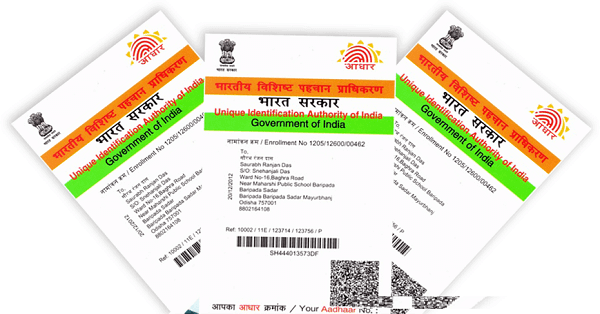 Aadhaar is a 12-digit unique identification number issued by the Unique Identification Authority of India (UIDAI) and it is being made mandatory for using a host of government services. The report further quoted the official as saying, a certificate of registration issued by the Embassy of India, Kathmandu, to Indian nationals is “not an acceptable travel document” for travelling between India and Nepal. “However, the emergency certificate and identity certificate issued by the Indian Embassy in Nepal will be valid for single journey for travelling back to India,” the official said citing the communique. Meanwhile, teens aged between 15 to 18 years will be allowed to travel between India and Nepal on the basis of an identity certificate issued by the principal of their respective schools in a prescribed form, the report quoted the official as saying. On the other hand, in case of a family (like husband, wife, minor children and parents) travelling together, all the members of that family will not be required to carry relevant documents (such as a passport or an election ID) if one of the adult members has valid travel papers, the official added. The official, however, explained that the other family members must have some proof of their identity with a photograph and their relationship as a family, such as a CGHS card, ration card, a driving licence or an ID card issued by school/college. Indians travelling to Bhutan will have to carry either an Indian passport with minimum validity of six months or a voter identity card issued by the Election Commission of India. While Bhutan has about 60,000 Indian nationals, employed mostly in the hydroelectric power and construction industry, about six lakh Indians live in Nepal, according to data by the Ministry of External Affairs. It has also been reported that between 8,000 and 10,000 daily workers enter and exit Bhutan everyday in the border towns. While Bhutan shares borders with the Indian states of Sikkim, Assam, Arunachal Pradesh and West Bengal, Nepal shares Indian States of Sikkim, West Bengal, Bihar, Uttar Pradesh and Uttarakhand.